58 Championships - AOBA Nationals, shows at every level - that is what his get have done! He is undoutably the BEST Black Herdsire in the USA! 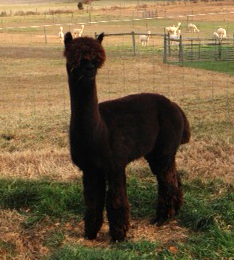 Black Epic puts out stunning uniformity of micron, color and type, fleece brightness and show-stopping style in his crias - black, grey, brown and fawn! 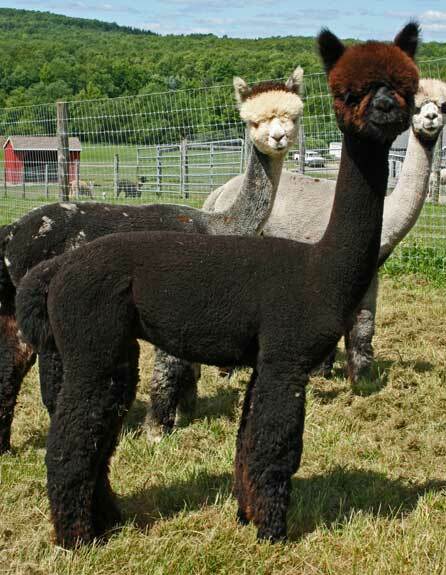 Black Epic is an exceptional alpaca, as noted by judges from around the globe! His conformation is perfection itself and his fleece is black, dense, & incredibly soft with outstanding crimp ˆ from the tips of his toes to the top of his typey head! This correct, sound conformation combines with a terrific personality to complete the package. 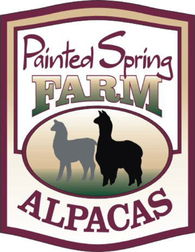 This outstanding herdsire is producing quality crias that win! He has multiple color champion and blue ribbon get in black, grey, brown and fawn and terrific upcoming get in black, brown, grey, rose grey, and fawn! Come to the source for color, fineness, density, conformation and show-stopping style - The Producers at Hobby Horse Farm. Contact us for our Championship Rewards, Small Breeder and multiple breeding discounts! We want to give you the genetics you are looking for! 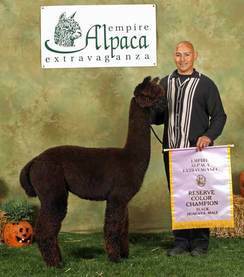 Blue Ribbon Girl Makes Champ Cria! What an amazing girl this is! Graciela is the daughter of our multiple blue ribbon stud, Patagonia's Seymour, and our beautiful true black full-Peruvian dam, Faith. Graciela's fleece is so lustrous that it shimmers in the sunlight. She has definitely inherited the proud stance and square conformation of her sire and the fleece fineness of her dam. Both sire and dam have wonderful fleece character, and Graciela has certainly gained this from them both. When we decided to add a black herdsire to our lineup, we knew that Black Warrior was the boy we wanted. He is the full package, beautiful typey head, fleece that rivals light color fleece and genetics that are spectacular and new to our herd. We hope to be able to continue on with our friend Alan's plan for this fine young male. We are truly impressed with his lack of guard hair and density in his true black fleece. We are looking forward to putting some color into our herd. Spring 2015 ~ Warrior's first 2 cria are on the ground! Med fawn (Hayley) and a med brown (Mason) - both out of white girls. Amazing bundles and crimp on both babies. Well worth the wait for these lovely babies! Way to go Warrior! 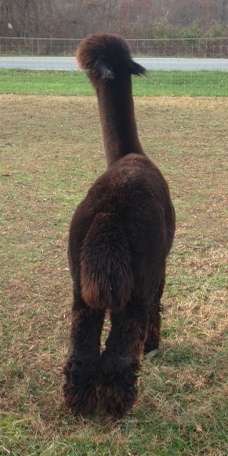 Fall 2015 - Warrior sired the lightest silver gray cria (Max) out of a MSG dam. What a pretty little boy! Warrior continues to give us some of the nicest babies on the farm. Don't miss a chance to put him to use on your girls.